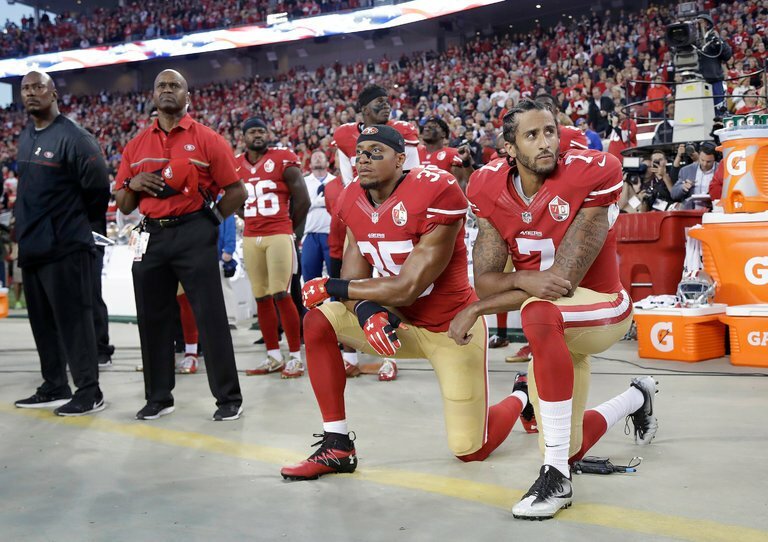 The National Football League continues to exist in the eye of a social media hurricane, triggered a year ago when San Francisco 49ers quarterback Colin Kaepernick expressed concerns with alleged police brutality and discrimination against African American citizens by kneeling on the sidelines during the national anthem. Kaepernick’s protest cast the NFL into a tempest that seems to be gaining momentum with every passing week. Last Sunday, players from a number of NFL franchises “took a knee” during the anthem. Others stood arm-in-arm while the anthem played, while others remained in their respective lockers rooms until pre-game festivities were completed. Those antics drew the ire of many fans, including President Donald Trump, who called last week for the immediate firing of any player who refused to stand for the Star Spangled Banner. 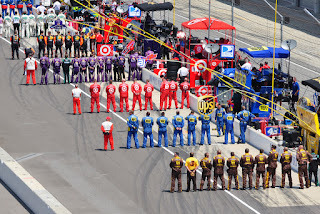 Monday, Trump expressed his respect for NASCAR team members, who traditionally stand at attention and honor the flag. As is often the case with the incumbent POTUS, controversy ensued. Media members scurried to secure opinions on the topic from NASCAR drivers, team owners and the sanctioning body. In this writer’s personal opinion, you’re either in favor of free speech, or you’re not. The right to speak one’s mind is easy to defend when we’re talking about apple pie, the Boy Scouts and loving your mama. But when the American Nazi Party decides to march down Main Street in Skokie, Illinois, that’s when we find out who really believes in free speech. Simply put, the free speech most worth defending is the speech you disagree with most. People have the right to say things their neighbors disagree with. It is one of the basic tenets upon which this country was founded, and it is absolutely worth defending. It would be easy – and incredibly convenient – if every NASCAR fan felt the same way about every issue. It would also be unbelievably boring. But until that happens (and it never will) we must be willing to allow people to say what they think, even when we don’t necessarily agree. NASCAR crew member Johnny Jackstand has a constitutionally guaranteed right to take a knee during the national anthem at this weekend’s NASCAR race. That right does not, however, preclude him from suffering the potentially negative consequences of those actions. If Johnny Jackstand turns wrenches for Richard Childress Racing or Richard Petty Motorsports, the decision not to stand and honor the flag during the national anthem could cost him his job. After all, team owners have a right to their opinion, too. Johnny expresses his views, R.C. and the King express theirs. NASCAR fans would do well to heed the advice of RPM majority owner Andrew Murstein, who said Petty, Childress and some of their fellow owners “are all proud Americans who have lived through world wars and turbulent times. While I respect their thoughts and personally I think it’s wrong to kneel, I wouldn’t fire someone for expressing their feelings. I would sit them down and say, ‘It’s the wrong thing to do that” and (that) many people, including myself, view it as an affront to our great country. “If there is disenchantment toward the President or a few bad law enforcement officers, don’t have it cross over to all that is still good and right about our country,” said Murstein. “The flag isn’t a flag of a few people; it stands for all of America. Yes, there are problems here — but they are nothing close to the problems in North Korea or other parts of the world. We must come together as Americans and respect everyone and everything — especially our flag, which is a symbol of the United States, the greatest country in the world. At the end of the day, no one can presume to speak for all of NASCAR. Last week’s statement from the sanctioning body was not attributed to any individual. Not Chairman/CEO Brian France, not President Brent Dewar, no one. With all its bluster and bombast, the current free speech debate threatens to lose track of its original point. Many of the loudest voices debating the issue today have no memory of the issues that created it, and that’s probably okay. At this point, the righteousness of Kaepernick’s cause has become irrelevant. He – like the rest of us -- has the right to speak and protest on any topic he sees fit; right or wrong. That is, after all, the American Way. Illinois Nazis? WOW, old reference, and so true. "Freedom of speech protects that with what we do not agree." I remember this from American History II, in college. We may or may not agree with the kneeling, but it should be protected speech. Also, NASCAR teams do have the right to fire those who do not agree with the owners' views: Independent contractors have been and will be fired for whatever cause. A McDonalds worker will get fired for insulting the customers while working. 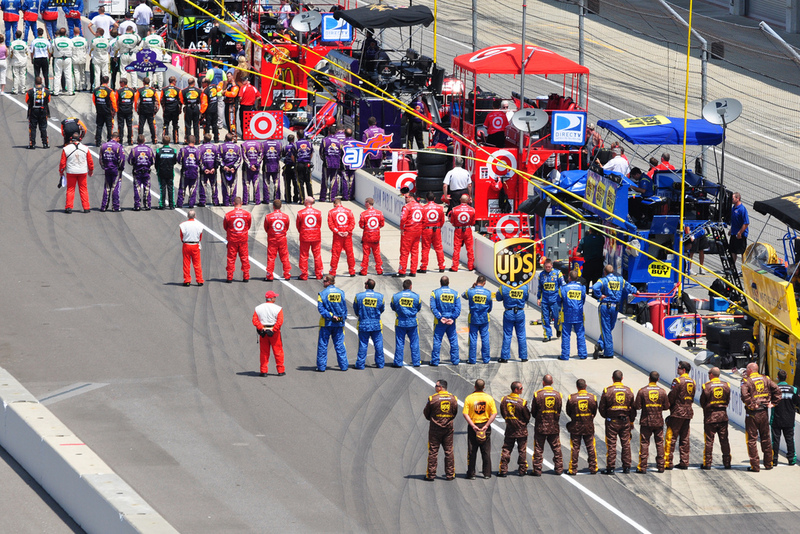 Why should a NASCAR driver or NFL player be treated differently? Insulting a large group of customers, taking away their enjoyment because you cannot wait until you are off work to make your statement is pathetic. There is no guarantee of free speech at work for a private institution. The NFL is doubly guilty for not allowing the Cowboys to honor fallen officers with stickers on their helmet, but they defend the offending of veterans and active duty personal (some of whom are presenting the colors at the game or doing flybys). I heard Dale Jr and I know how offended my Dad is at all this, and well, I'm only a fan of my Dad after this. If the NFL decides to allow its employees to protest, that's THEIR right just as much as it is the right of the players to protest in the first place. Do I find it distasteful, disrespectful and insulting to every person who's fought to defend this country? Absolutely. I wish they would do their protest at ANY other time during the game. But by that same token...they have every right to protest peacefully however and whenever they choose. If their employer allows it, then that's the employer's prerogative. And their right. Because for every bit of distasteful, disrespectful and insulting to every person who's fought to defend this country, that right to protest is the very thing that those people fought for. They didn't fight just to protect the right to wave confederate flags, but the right to protest the very flag that symbolizes their freedom to protest. Irony? At its finest. But disagreement with their reason for protesting or the method of protesting doesn't invalidate the right to do it, or their employers to allow it. I get what your saying because you said it very well! The only thing I don't get is why you don't put your name on your opinions? It's not that hard to do. Because I work for a company that may or may not agree with things posted online in a public forum. I'm not retired, and I still answer to an employer that has a right to terminate my employment should they so choose. Likely because in today's world, one has to fear repercussions of having an opposite opinion to some. Its too easy to have your opinion blow up in your face depending on your employer. Oh hell, isnt that the topic of this article? Wow...You hit this so squarely on point. I've never been too sure about you Moody but I gained a lot of respect for you today. It would seem reasonable people are either disappearing or holding their tongues. Thanks for speaking up. Reposting to Twitter. I agree totally. My opinion of what and how they protest means nothing. Great men and women fought and died for the these freedoms. We have to use them to ensure that was not in vain. No matter what you are protesting/saying. Speech in all of its forms is protectorate from government sanction. Your speech is not free from sanction by your employer. I worked for that big candy company all my life that is on the hood of the 18 car. It was very clear to me that my views were just fine outside the doors of that big company, but I did not have freedom to say anything I wanted while under the employment of that great company. NFL players should respect the wishes of their owner who signs the checks. The players can say whatever they want or act however they want, when they are representing themselves and not the company they work for. Dave, your chronology doesn't include the part about Trump's speech last Friday in Alabama where he encouraged NFL owners, whose players kneel during the Anthem, to "get that sonofabitch off the field." Your writing also lacks mention of the President's tweet concerning Steph Curry and the Golden State Warriors team visit to the White House. These actions by the president caused the response of athletes, artists,and others through the weekend. All the facts, factually stated, are crucial in writings and conversations in these trying times. I'm not saying anything about right or wrong. I'm not taking issue with Childress or Petty or you or anyone else, for that matter. I'm just a guy who served 13 years in the USNavy. I enlisted in 1982 three months before graduating high school. On my first deployment,1983, I carried the body bags of dead Marines blown up in their Beirut barracks. At my second duty station,1987, I lead an Honor Support Team that buried dozens of sailors blown up on the USS Stark. Those dead men served to protect and defend our Constitution and all the rights that document and our country represent. As did I. Our citizens have the right to express themselves in any peaceful manner they choose. I served to protect and defend that right, and I stand by it to this day. Thank you for your service Mike, 85-89 I was in the Air Force, but I still like you, lol. What people fail to understand, and typically ask a troop, is that we signed to defend the Constitution, not a song or flag. Those items are beloved, but our rights come from the Constitution and the Bill of Rights. I have stated those rights are not just the popular rights, but all rights. And before the left or right get smug those rights include both marching with a nazi flag as well as those marching and burning the American flag. Like most of us, I stand, I place my hand on my heart, I actually fly 2 flags at my house, but I/we promised our lives for the rights guaranteed in the Constitution. Well said. My thoughts exactly. I have a son in the Air Force who feels the same way as you. The Trump statements on Friday and over the weekend are only fanning the flames. Mike White, Trump's speech about "get that SOB off the field" and Steph Curry are not relevant to the real issue. Trump wasn't and isn't the problem. The response by the athletes came of their own sense of entitlement (aided by being enabled by media and by team owners) and to push a fraudulent narrative. The facts that the protesters would allude to undermine their premise - there is no police killing issue, there is an issue of police being killed. The system of law is run by Progressives who usually are detriments to true justice via their advocacy of favoritism. People need to reject the alibi and face the reality that these protesters do NOT have the right to do what they are doing - character assassinating anyone and everyone. "concerns with alleged police brutality and discrimination against African American citizens"
I'll just leave that up there. Through mine eyes you shall see the light. Let us be very clear. Taking the knee is not a disrespect for the country. It a sign of rejection of the disgusting behavior that is tolerated in the name of religion and nationalism. We demand respect for the flag, but desecrate the US Constitution, without. the flag would be worthless. BTW, I don't hear much complaining from the "patriots" about the Stars and Bars, a flag of treason, at races. In, at times, abundance. Also, stop shooting melanated people for mo reason, and resume standing. Deal? Equal application of the rules. Vet here. Yes I signed up to defend the constitution. I am now in the position that my oath those years ago has given you the right to dishoner me, those before and those today. I don't question taking the oath I question your heart. I've said before & I will say it again. If the protest is about police etc,go peacefully protest at the police dept & city hall. We became America bcause we left England & the imposed authority of the crown. If you don't like America, maybe go live in England & be part of "one nation under the crown" Nat'l Anthem celebrates breaking free of king & crown. The national anthem celebrates the right to not be forced to celebrate the national anthem.